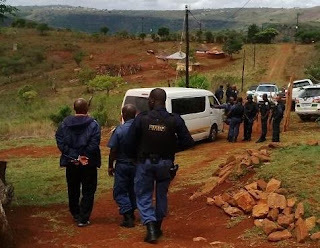 4 South African men, including an ANC Ward Councilor who appeared at the Estcourt Magistrate’s Court Monday, are now facing cannibalism charges after one of them reportedly walked into a police station, to confess he’s “tired” of eating human flesh. Upon questioning, he produced part of a human leg and hand, and then led to Police to a house in KwaZulu-Natal where more body parts were found. It was also gathered that apart from the cannibalism charge, two of them traditional healers, were arrested and charged with murder and conspiracy to murder.